The attempt in Arizona to pass a law permitting discrimination against gays and lesbians by Christians was thwarted by the overwhelming outcry of people in the 'real world.' But the recent Duck Dynasty fiasco has shown that the power of the Left is slipping. What happens with the next state where the passage of such a law is attempted? We can stand back and allow the legal construction of a Jim Crow system of discrimination aginst Gays and Lesbians, sure. What we can do to resist such laws is not an atheist centric problem, it is a humanitarian problem...one that which all people who prize liberty and understand that the only true judge of freedom in a country is how the lowest and most hated of minorities is treated must continually fight against. But what is our legal standing? Gays and Lesbians are not the most hated and feared minority in the United States. Atheists are. The rather slender thread upon which atheism is a protected belief is a corrolary to the principle of Freedom of Religion that the decision to not believe at all is also implied. But this implication is far from written in stone. The Freedom of Religion clause only condones and supports the individual's right to have and act upon his religious beliefs. I have long contended that this does not necessarily imply protection of non-believers. Laws restricting the freedoms of atheists could very well be found Constitutional. What do we do to establish and insure a continuing legal right to be atheists? Hi guys, nothing is going to change as power& religion are interlinked in most countries also with most political organizations sects & crazy ideology . "The Freedom of Religion clause only condones and supports the individual's right to have and act upon his religious beliefs. I have long contended that this does not necessarily imply protection of non-believers. Laws restricting the freedoms of atheists could very well be found Constitutional. " As the locals say around here: "That dog won't hunt." The 1st Amendment ensures there is no law that can be created that would respect the establishment of religion. Introducing legislation to curtail the freedom of atheists would seem to fall into that category. What about 'nuisance' laws such as Arizona? I'm thinking laws restricting access to venues open others. For that matter, since this law is not written to address the LBGT community directly, could this law...or this sort of law...be used to deny service to atheists? 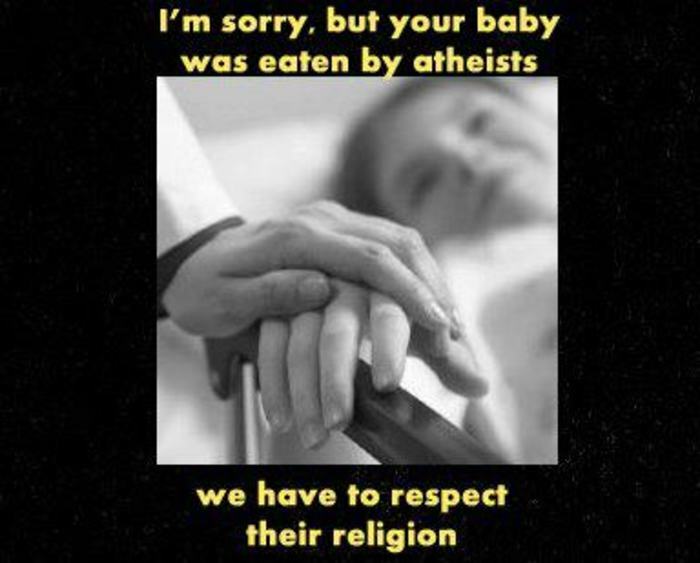 I for one will defend my right as an Atheist to eat babies. Because of the first amendment protection against establishment of religion, such a law could never be truly constitutional. There's a very basic separation between forcing people to believe in things and not doing that, and I don't think this line has ever been crossed (in the public sphere) in a way that hasn't created a huge public outcry. Even the religious can appreciate the encroachment on the first amendment that would be represented by a requirement of belief in some, any, sort of God. It's in their interest to guard against any sort of government-endorsed or -sponsored belief system, since this is the only way to completely ensure their ability to practice their particular religion. I can only respond have you been paying attention? Whether or not a law if "truly constitutional" doesn't matter any longer. We have a whole new ballgame going on here. The Libertarians are, at the same time they are keeping up their anarchist sentiments for the lower classes who just know "something is wrong and needs to be fixed" are making inroads in the very people who should know their lies for what they are. Perhaps it's because I am from West Virginia and I am a Bus Person...I have a job, I rent my apartment and I don't own a car and depend on public transportation...hence, I am a "Bus Person"... that I see things totally different. Yes, in a nice little liberal state where you don't have to worry about your neighbors using the Zimmerman Law against you in an actual physical attack...then such waffling on the subject is excusable. But I've been trying for years to convince liberals that they really have no clue what is going on down here in the trenches where the battle is really being fought. My grandfather and great grandfather stood with the miners at Blair Mountain. For those out there in the flatlands who don't know what that means, look it up on Wiki. We'll stand that way again...against the Capitalists and all their apologists...the problem is they don't remember what we learned back then. Explaining to them what is really going on and how they should be resisting it to the point of violence is a goal I've set for myself. I guess I'm saying since your views are being expressed in a venue that is...shall I say...protected...then you need a reality check. I don't mean to be offensive, but I'm tired of Liberal pontifications while the world is collapsing around me.